Thank you to those who helped expand my reading list last entry. I will be following up on your suggestions enjoyably, and maybe even commenting if time allows. If you want to continue to be helpful, let's play Name That Plant. What is this, which hath sprouted in my garden? Keep in mind I'm in Seattle, therefore it's probably not tropical. For ID help: the flower has no scent that I can detect, nor do the leaves. I wish it weren't pink, but since it's so low-maintenance, it's welcome to stay. Why are so many flowers pink? Oh well. Want your kitchen to smell good? Buy a small amount of garam masala spice mix from the bulk spice bins at your grocery store. Leave it in a plastic bag on your counter. Voila--whole kitchen permeated with aroma of coriander, cumin, cinnamon, clove, pepper, and whatever else goes into garam masala. At least, that's how it has happened for me. P.S. I had to delete a Shakespearean greeting using the name "Coriander" just now. How now, good Clove, our gentle host Lord Coriander bids me make you welcome! And I have no idea what the flower is if it's not a hibiscus. Looks like one to me, and I know my grandmother grew them here, so it seems reasonable that it could survive up there, too. Forsooth, Lady Caraway, thou art not mistaken in thy surmise! Turns out there are species of hibiscus that are not tropical and are in fact hardy enough for Seattle. (Called, oddly enough, "hardy hibiscus.") I'm thinking it's one of those. As the person before said, I believe the flower is some variant of a hybiscus, but I really can't tell unless I could see the stigma and stamen. 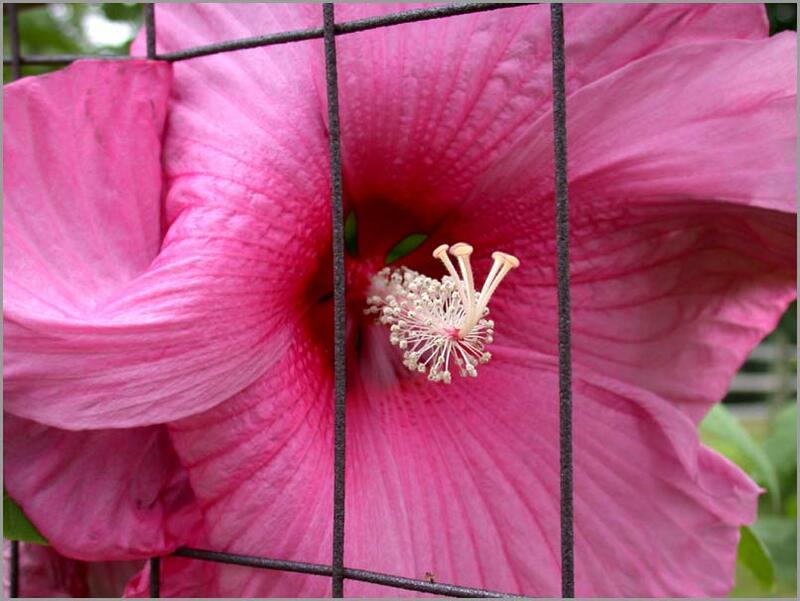 If it is a hybiscus, it should be taken indoors before the first frost... they will grow most anywhere and enjoy moist soil. Totally unrelated, but I just read your condensed version of HP and the Half Blood Prince and I was wondering if you have done the other books as well. That was SO well written and perfectly done... many thanks to you for providing great entertainment! I agree with all the other users -- some variant of hibiscus -- although, based on the leaf-shape and color, it looks like it could easily be Rose of Sharon, which is more likely to grow in your climate. The neat thing about the Rose of Sharon is that its blooms only last one day. Is that the case with your plant? And in doing research on this, I discovered that the scientific name for Rose of Sharon is Hibiscus syriacus, so it is, after all, some variant of hibiscus. I second the Rose of Sharon. Especially as it came up "volunteer". They're very hard to kill. Yup--that's pretty much what I came up with too. Though the bloom has so far lasted two days. :) The leaf shape was what threw me at first, since hibiscus usually is described as having oval leaves, and these are almost maple-like. But the Rose of Sharon species could be a match. Or possibly one of the zillion "Rose Mallow" species of hibiscus, which could also grow up here. Hmm! That's a pretty flower -- have you discovered its identity?